Situated in the heart of Mumbai’s shopping and business district, the Oberoi combines the finest contemporary and cutting-edge accommodation and service with the timeless traditions of the subcontinent. Overlooking the Arabian Sea, the 287 guestrooms and 73 suites are luxurious havens of contemporary elegance and have played host to heads of state and other dignitaries. The luxury hotel is also a perfect business destination; The Jaipur Suite and The Udaipur Suite are ideal for intimate meetings and conferences, while a 24-hour Business Center is available for guests. Recreational facilities include an outdoor heated swimming pool, a fitness center and a full service Oberoi Spa. The Spa and the Fitness Center are open 24 hours. 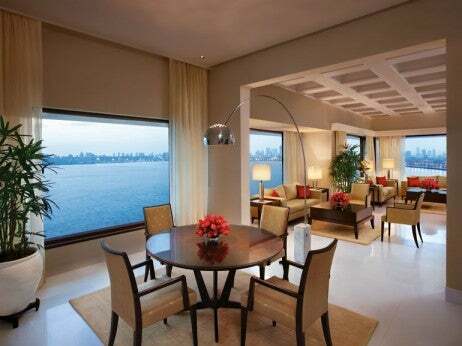 Why we love it: Named after the largest Indian diamond in the world, The Kohinoor Presidential Suite offers contemporary elegance and spaciousness, complemented by expansive views of the ocean. Located on the 21st floor of the hotel, the suite comprises a living room with a fully equipped workspace and dining area, a master bedroom with a luxurious en suite bathroom, and an interconnected guest bedroom, along with a butler pantry and powder room. Graced with a grand piano, the suite showcases specially commissioned oil paintings and lithographs from the personal collection of the Chairman of The Oberoi Group, Mr. P.R.S. Oberoi. A connecting room serves as a security room where personnel can monitor various pre-installed hotel security cameras.